If you don’t have access to it, you can still get your cuteness-fix in this post, so keep reading. *My Amazon Smile link supports the Born Free Foundation. Buchanan takes us along on his adventure into the Russian wilderness and we get some serious close-up action of the cutest little grizzly bear cubs. I’ve been lucky to have observed grizzly bear cubs in the wilderness, but I’d never heard the cute noises they make, when they are sleeping and hungry. I don’t usually write about documentaries on this blog but I do write about some of my adventures in the wilderness, conservation and my love of bears. This documentary shines a spotlight on the innovative Orphan Bear Rescue Centre in Russia, where a brilliant family of biologists, the Pazhetnovs, have developed a unique fast track approach to rescuing orphaned brown bears and preparing them for their release back into the wild. And yes, the Orphan Bear Rescue Centre, REALLY DO SAVE baby bear cubs! In fact, they have saved more grizzly bear cubs than anyone else on the planet. Incredible, right? And THAT’S exactly why I’m writing about their work and how YOU can get involved too! Valentin Pazhetnov, founder of the OBRC has been running behavioural studies of bears from birth through to independence, since the 70s. His research led to the development of a unique fast track system in the 90s which has resulted in the Centre successfully rehabilitating well over 200 bears! Three generations of the Pazhetnov family choose to live in the wilderness and make many personal sacrifices, to focus on their orphan bear cub rehabilitation programme. Three generations of Pazhetnovs: Vasiliy, Valentin and Sergey. Katya Pazhetnov feeding a young bear cub. During the ‘Den’ phase of the rehabilitation programme, they feed, wash and massage the bears every 2 hours. Looking after orphaned grizzly bear cubs is a serious, round-the-clock commitment! Why do bear cubs become orphaned? 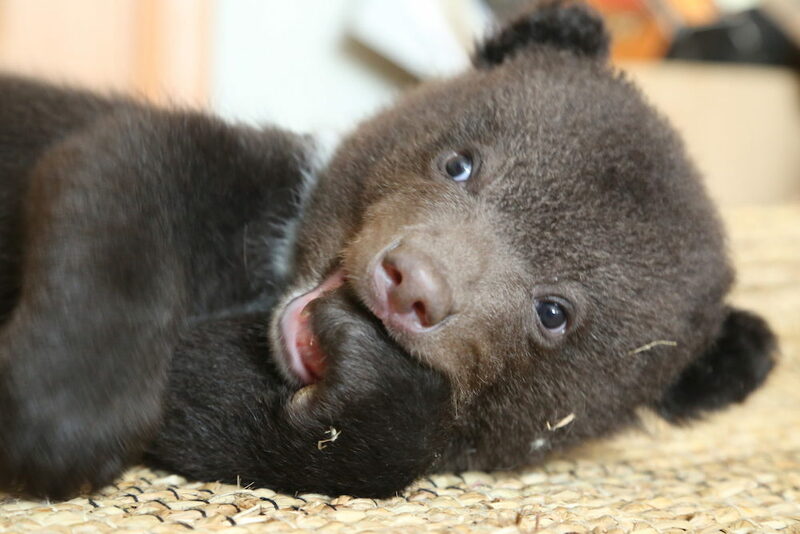 Thousands of bear cubs are orphaned every year around the world. Bear cubs are orphaned for a range of reasons but usually because their mother has been killed, or because she has been scared away. Grizzly bears are hunted and other activities such as logging, can scare a mother bear into abandoning her cubs too. We know how to rehabilitate wild bears, but that’s not all. 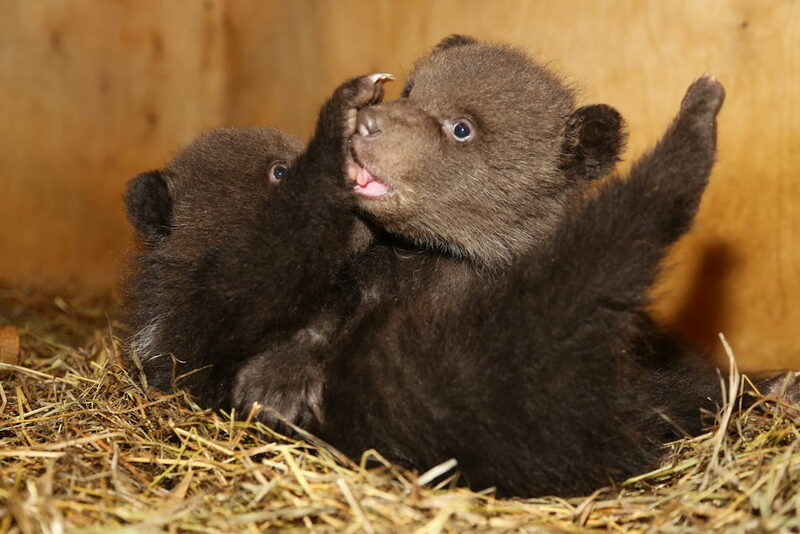 We have fully restored the micro-population of bears in the Nature Reserve “Bryansk Forest”. There were only 6 bears left, they were isolated from the rest of the area by the treeless space. Now there are about 50 bears. Recently, we have developed a completely new technique that allows return to nature, cubs born in ZOOs. This is why the work of the Pazhetnov family is so amazing and critical for sustaining grizzly bear populations. Humans take a lot from nature, we damage it, we harm it, disturb wild animals, wildlife, trees, plans, flowers…This process of raising orphan bear cubs, it means we are paying for something bad made in the world. When ‘Grizzly Bear Cubs and Me’ was broadcast last year, it came to light that the OBRC had lost its funding. The International Fund for Animal Welfare (IFAW) had partnered with the OBRC for 24 years, but unfortunately last year, IFAW ceased all projects in Russia. Losing their funding was a devastating blow for the OBRC, although IFAW worked with them to develop a transition plan, so they can continue to be independent. Will you help me support the Orphan Bear Rescue Centre? Losing funding does put the OBRC’s innovative rehabilitation programme at risk though. Which in turn, risks hundreds of orphaned baby bears dying in the Russian wilderness. It also puts at risk the innovative research they do, which can benefit grizzly bear populations around the globe. Born Free Foundation: make a one-off or monthly donation via the Born Free Foundation website. The OBRC: make a one-off or monthly donation via the OBRC website. It’s encouraging that the Born Free Foundation are supporting the OBRC this year because it provides the opportunity of increasing the visibility of their work. However, by choosing to make a donation directly to the OBRC, you will be making funds available immediately for the Centre to use as needed. So far, I’ve been making personal donations via the Born Free Foundation because I want them to continue supporting the OBRC. I do plan to donate directly to the Centre though too. Share this post: if you tweet this post, please mention by travel Twitter account, @KookyTraveller and I will also re-tweet you. Watch the documentary and discuss the work of the OBRC with family, friends and colleagues: invite them to donate too! Follow the OBRC on social media: share their Twitter, Facebook and YouTube posts. Write about the OBRC: if you are a blogger interested in conservation and you want to get involved, please contact me. Even if you don’t have a blog, you could raise awareness amongst professional connections by blogging on LinkedIn. In return (providing your post meets my criteria), I will also blog about your post, link to it from this blog and share it on social media. We can achieve more when we collaborate, so let’s make use of our social media channels to help the OBRC get more funding, to help them continue their incredible work! Important: this invitation to raise awareness of the OBRC, is NOT an invitation to visit the Centre. They do not accept visitors and the success of the rehabilitation programme is dependent on minimal interaction with humans. All those who work at the Centre are experienced and qualified to do their work. Do you sell arts, crafts and/or jewellery? Would you be prepared to design an item (or range), celebrating the work of the OBRC and donate profits directly to the OBRC? I’m also happy to promote your work and if I really love it, I may also buy it too! Shop bear gifts on the Jane Lee McCracken website. How will you help support the OBRC? If you’re interested in helping, I’d love to know! Tell me, in the comments below or email me via my Contact page. Acknowledgements: thank you to Gordon Buchanan and the team behind Grizzly Bear Cubs and Me. Without this series, I may never have heard about the brilliant work that takes place at the Orphan Bear Rescue Centre. Thank you also to Katya Pazhetnov for giving me permission to republish photographs to raise awareness of their work. All photos are the property of the Orphan Bear Rescue Centre and are covered by copyright. Disclaimer: I was not asked to write this post and have received no compensation for it. I’m writing this because I was inspired by the incredible work that takes place at the OBRC. ❤️ To learn how I work with partners and brands, please read my Ethics Page.